This double sided Lumiere popup display is perfect for a 8ft exhibit space. The Lumiere is a portable popup display is perfect for trade shows, conventions and promotional events. This trade show booth works great as a divider wall in retail environments. 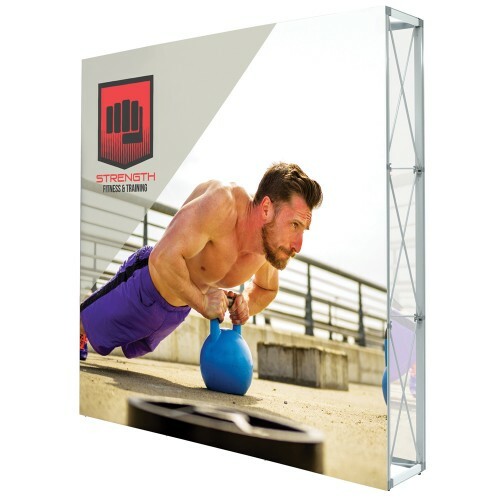 The silicone-edge graphics (SEG) are dye sublimated fabric the push fits snugly into the frame from a smooth frameless look with no distortion around the edges. The popup frame collapses down and fits in the convenient travel bag. Setup can be done by 1 person in about 5-10 minutes. Portable, easy and stylish.